The horse racing journey of West Point Thoroughbreds Partner Dana Fitzsimmons has spanned decades and taken him from the Derby infield to the owner's box. Dana shares what it means to be a passionate fan turned Kentucky Derby horse owner in this blog. I attended my first Kentucky Derby in 1975. My University of Toledo college roommate, Mike Hirt, and I joined some buddies and headed to Louisville in the back of a pickup truck. That year we camped in tents on the University of Louisville campus within walking distance of Churchill Downs. I watched my first Derby from the Infield. The Infield is quite a place with plenty of distractions all day but we pushed and pressed our way to the fence to watch when the colorful blur of the Derby field raced past. The horses were fast, powerful, and beautiful. We enjoyed it all so much that we made a commitment to attend again the following year. It’s now forty-three years later, and we haven’t missed a Derby! As I learned more about horse racing, my interest grew stronger. I have visited the Kentucky Derby Museum, toured Kentucky horse farms, and became a student of the Derby. I have learned the history and traditions surrounding this wonderful event and have gained an appreciation for the reverence that Kentuckians and others hold for the Derby and thoroughbreds. I’ve memorized the Triple Crown winners and many of the other Derby winners from my Kentucky Derby glass collection dating back to the 1950s. Some things have changed along the way while others haven’t changed at all. Mike and I have both gotten married, and we have watched our families grow up. At Churchill Downs we longed for the day when we would have seats in the grandstand and that happened. And then we hoped for better seats under cover and closer to the Finish Line. One year another friend, Lou Phillips, secured a box of seats near the Finish Line, and we’ve been guests of hers ever since. Some things haven’t changed. We still enjoy mint juleps every year and we always tear up during the playing of My Old Kentucky Home. Seeking greater involvement in horse racing itself, I began to dabble a little bit with horse racing partnerships. It’s a way to get involved with limited resources but still enjoy the thrill of racing. 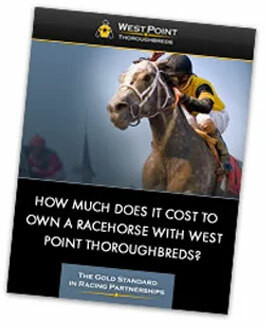 Most recently I have been involved with West Point Thoroughbreds under the care and tutelage of Terry Finley, Joe Migliore, and the rest of the West Point staff. 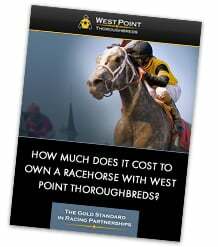 West Point’s strong horse buying process, their creative partnering opportunities, their excellent communications and educational events, and the opportunities for involvement with horses of different ages have been great. The chance to be part of Always Dreaming just happened recently. My husband, Phil Layton, and I jumped at the opportunity and then quickly made arrangements to travel to South Florida to see Always Dreaming run in the Florida Derby. We were so excited when he won, and we could barely catch our breath as we began to think of a trip to Louisville and the Kentucky Derby. And now my 43-year-old fantasy is becoming reality. To be a partner in the ownership of a horse entering the Kentucky Derby is beyond my wildest dreams. To be at Churchill Downs on Derby Day with a horse in the Derby is hard for me to comprehend. To do the owners’ “walk over” from the barns at Churchill to the paddock will be exhilarating. To be in the paddock watching Always Dreaming and visiting with the jockey will be breathtaking. To see Always Dreaming head onto the track at the bugler's “call to the post” will be thrilling. And competing in the Kentucky Derby will make us part of a small select group of horse owners that have had the opportunity to experience the excitement of this moment. A great story from a dedicated racing fan! We’re pulling for you guys. LET’S GO ALWAYS DREAMING!!! As a Fort Myers, Florida, resident will be cheering on Always Dreaming. It is about time the Florida Derby winner wins the Kentucky Derby. Let’s go ALWAYS DREAMING! !